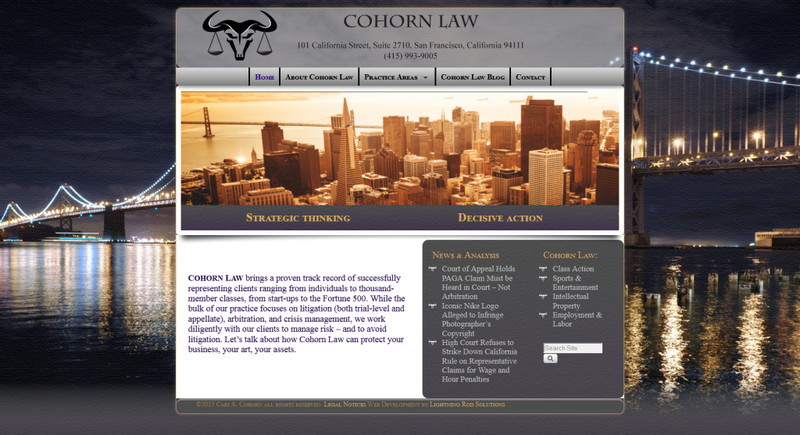 California attorney Cari Cohorn’s new law firm, Cohorn Law, revealed its new website this March to rave reviews. This Lightning Rod Solutions project involved in-depth market analysis and robust collaboration with the client, to produce a stunningly professional, expertly branded presence in the industry marketing space. This website, like all Lightning Rod Solutions web projects, is optimized for maximum search engine ratings and placement. The logo was envisioned by the client and designed by Lightning Rod Solutions. Cohornlaw.com is a fully-equipped WordPress website, usingthe WordPress 4.1.1 build and the Weaver II Pro fully responsive theme. Installed plugins include SEO by Yoast, Wordfence Security, Updraft Plus automatic backup, the sizzling hot HTML5 LayerSlider by Kreatura, and Contact Form 7.